With a rear spring like that what are these vehicles destined to be? Radiator looks a bit like a Maxwell. The radiator side's sweep to the frame has me stumped. It should be a good clue to anyone who has seen that. Those factory photos of chassis' lined up are intriguing. It sort of resembles the old Rainier plant i started in long ago.It looks as if there is a second floor above? Bud. maybe i'ts a foreign make, rh drive. looks like they weren't assembled up against the wall ? i see now they are on supports.maybe they were assembled there. Maybe these cars are built in rows and the maker hadnt used the assembly line way. Not yet anyway. Anybody know when foreign makes started using the line method? Most makes pre T were right hand drive.Bud. The way the rear spring doubles back to the top of the frame should be a giant clue. That's called a 3/4 elliptic spring, and more than a few makes over years used it. If enough clues can be gathered, maybe we'll learn what make ! REO!!! The bottom of the Reo radiator sweeps out over the frame rail. The hood does the same and the hood hooks come up through the hood sweep. Opps, I take that all back as Reo's were not right hand drive. Actually brasscarguy, Reo's like most of the early 1900's cars, were RHD up until 1910. I think the picture may be of the KisselKar factory from about 1908. 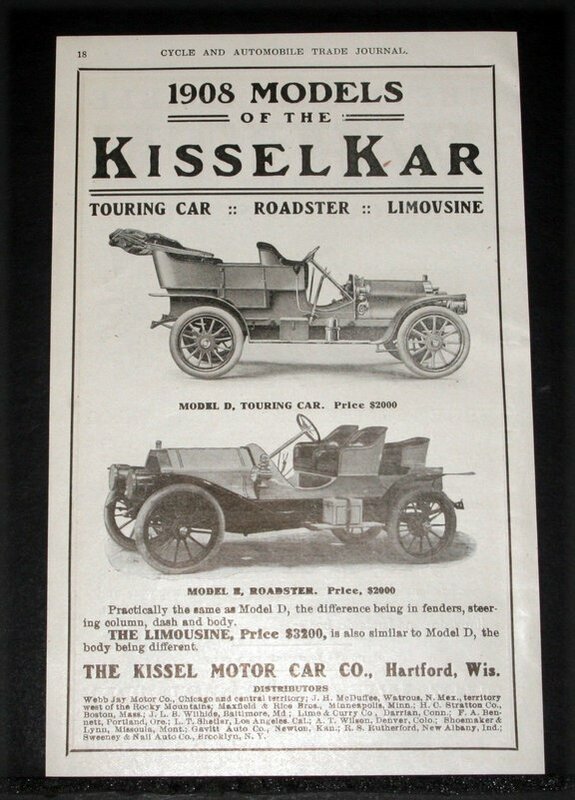 See the original ad below and notice the radiator and hood match the shape of the radiator and hood former in the factory photo. The bottom of the radiator sweeps out toward the fenders on each side as in the photo above. All 4 cyl reo's LHD would be true as according to the history of Reo, they developed the 4 in 1907 and produced/released their first 4 in 1911. I said Reo's RHD up to 1910. Jim, I don't think they are Buick Model C's. The Buick Model C has a 2 cylinder engine under the front seat. Under the hood are the fuel and water tanks. 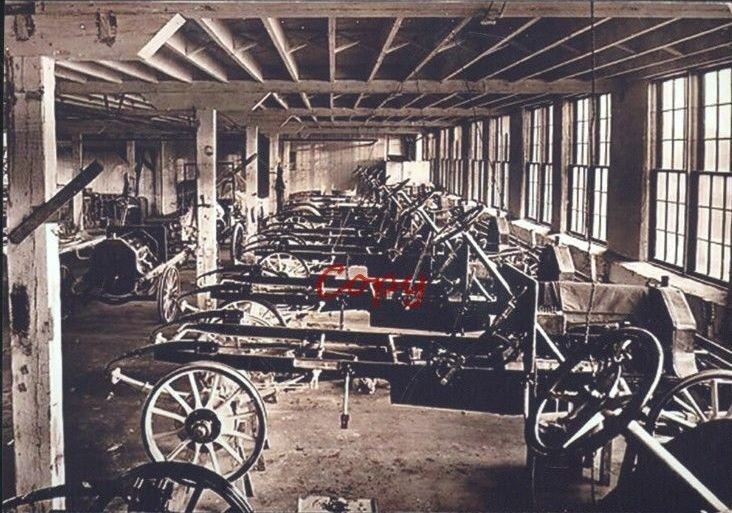 The factory picture above looks to be a conventional four cylinder engine. The Buick F was a two cylinder engine. My guess would be a assembled car like so many of the time because while we see several chassis we see no machinery?? Is that a coil box or oiler on the dash? Bud. Bud, you're probably right, although this looks like the end of the line- completed chassis waiting for tires and body work. Maybe there's other processes on different floors or in other buildings. I'm a little amazed our members haven't been able to identify the make as yet - must be a very obscure marque ? Bud, I believe that is an oiler on the engine side of the firewall. If we could get Rob to look he might have a idea? No Fords ever used the semi ellipitc springs.I think i have seen the radiator shape before so could it be a Rambler?? Bud in Wheeler,Mi. Aren't the Model Ts springs specified as "transverse semi-elliptic springs" ? My Mistake Rich,and i read it out of the book! I wonder why their are called that when they are not like the ones in the old picture? Bud. Bud, as I understand it, "full elliptic" would be like if you put two Model T front springs together, one inverted on top of the other. Half of that is "semi" elliptic, and if you cut the top half of "full elliptic" in two, and attached it to the frame as in the mystery car we're trying to figure out, you have "3/4 elliptic". Most cars from the mid 'teens well into the 30s used parallel semi elliptic springs up to the innovations in independent front suspension. Parallel meaning parallel to the frame rails. Earlier there were more interesting and elaborate suspension arrangements. 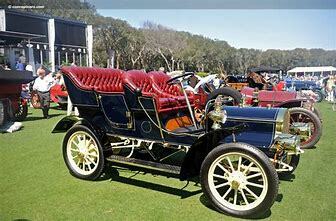 Many borrowed directly from the horse drawn "spring wagons" that were contemporary with early horseless carriages.